Online Betta Home Living Deals: Get $200 discount for Beko 7kg front load washing machine at betta.com.au. No need to apply any promo code too. Limited time Betta Home Living sale: Shop now and save up to 40% for hot deal floor care collection at betta.com.au. This offer doesn’t need any promo code too. Betta Home Living free shipping offer: Get LG refrigerator bottom munt 450L just in $1,488.00 LG Bonus $100 Cash Card, via redemption from LG. Betta Home Living free shipping offer: Get free shipping on all online orders at betta.com.au. HotOzCoupons.com.au is a one stop destination for online coupons in Australia. 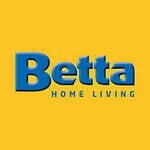 Checkout Betta Home Living promo codes and save huge. Stay tuned, new promotions are added daily.